Every year Schuyler School proudly presents a Teacher of the Year award. Christie Silva to this wonderful teacher. Q. What is reaction to winning "The Teacher of the Year Award"? Q. How many years have you been teaching? 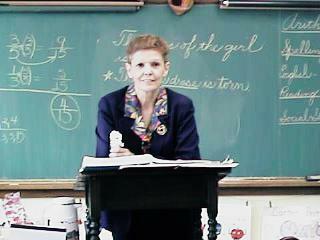 A. I have taught for 27 years in public schools and about 2 1/2 years in Catholic schools. Q. What was your favorite school to teach in? our school. Schuyler School, I feel, has become my home away from home. Q. What part of teaching do you enjoy the most? teacher can ask for in her lifetime. Q. What is your description of a great student? consideration for others, is the student that is "Number One" in my book.